Despite their high-profile marriage, reports claim that Taiwanese actor Vanness Wu (吳建豪) and Singaporean heiress Arissa Cheo (石貞善) are ready to call it quits. Vanness and Arissa got married in 2013 in Los Angeles. Within one year of their marriage, the couple fell into a vicious cycle of constant spats, and even took to social media to vent their frustrations. Previously, Arissa called Vanness a “hypocrite” and being “fake” with his Christian faith on her Instagram account. 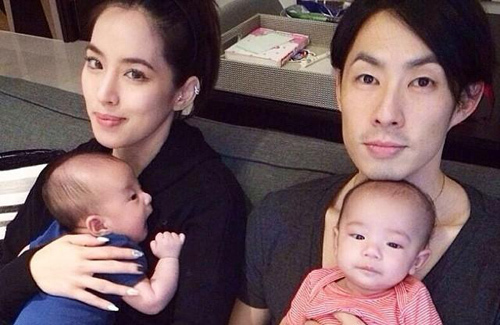 Vanness told his wife to “Watch her tongue” and refrain from cursing in her posts. Prior to the divorce rumors, the couple was seen often posting photos of themselves and their dogs. However, most recently, Arissa was seen with the dogs in Taipei, heading to an animal hospital before meeting with a male friend. Additionally, many fans noticed that the two have not shared a couple photo on social media in over two years. Vanness and Arissa have frequent arguments and spent a lot of time apart. The constant arguments made both feel very frustrated and drained, and Vanness already suggested divorce but the idea was shut down by Arissa. Although the pair continues to share the same house, they have long been leading separate lives and going out with their own friends. how did i see this coming back when they first married? not that i was cursing them or anything…. never should have gotten married. Both still young.. should just divorce and move on with life. @happybi Divorce isn’t simple once you consider financial implications (this would spark more fights for sure) and impact on their children’s upbringing (generally they tend to be biggest victims due to their innocence). why she wants to hold onto him when they constantly fight, it doesn’t seem they can save this marriage. If Vanness and Arissa constantly fight and don’t know how to resolve conflicts, it’s very draining on their marriage. But agreeing to divorce is also a very hard step to agree on. @jayne makes me wonder how they agreed to get married, lol. I believe in marriage vows, but I always had my doubts about this couple. From what I know, their marriage was always in the tank, with loads of arguments, some very hurtful towards each other. They seem to be content at each trying to win the arguments. Very immature indeed. @bubbletea “makes me wonder how they agreed to get married, lol.” Vanness and Arissa had an on-again-off-again relationship while they were dating. Sometimes marriage can be prompted by timing; maybe Arissa’s friends were all getting married around that time and gave her an urge to get married too. But as passion fades in marriage over time, and Vanness and Arissa’s tolerance for each other hasn’t increased, marriage can indeed becoming a “living hell”. The separate partying and separate social circles will only drive them further apart. I thought they had twins from that pic. Vanness Wu still looks so cute and young. Too bad his marriage isn’t working out but I always thought he’s found a compatible looking girl at least physical appearance anyway. @wm2017 that is the shallow problem that is part of the Asian culture. I have seen some not so physically attractive men and women in the ebiz married to each other and the marriages are working well in Hollywood. Physical looks should never, never define a marriage. Too many Asians stuck in the boonies. They might have the so called physically compatible look yet still the marriage was doomed from the very beginning. How comparable is that? @bubbletea It is true. That’s why it’s ironic sometimes. Never really can tell by physical appearance alone but then as humans that seems natural? haha Say Vanness’ case, he never strike me as the kind who will go for a goody good type you know what I mean? That’s why when I see this woman, she’s more like a wilder looking that’s exactly his type. ahha lol…Might not work but still the attraction is there. @wm2017 yes, I agree. I don’t see Vanness falling for a tender, soft spoken, subservient, quiet. “Yes husband” wife.. Maybe he should, he probably would have been happily married, even if wifey is miserable. I know a lot of Taiwanese, Mainland Chinese and Hong Kong celebrity marriages that are lol, like that. if they are stuck in a loveless marriage and they do not have kids, it’s time to consider divorce before they make up for a while and have a kid…only to realize they still want to split. @janet72 that is a very great point, Janet. They do need to make a clean break now. I always wondered what she saw in Vaness(a). He looks effeminate to me, just look at his arched brows ewww. @jimmyszeto In my opinion, your opinion is entirely valid, thumbs up! In Singapore, where they were married, I believe either party can secure a divorce, without the other party’s permission, IF they have lived separately for 3 years. Reportedly, they have maintained separate living statuses for 3 years now, or almost 3 years – Arissa in her family home in Singapore, and Vanness in the apartment in Taiwan. It has also been reported that whenever Arissa happens to be in the apartment in Taiwan, such as presently, with one of the 2 dogs being ill, then Vanness is traveling. So I would expect a divorce sometime soon.